I wanted to be a physician from a very young age. Most people find that interesting because no one in my family is a physician or even in the healthcare field. Going into junior high school, my best friend (who eventually became a nurse) and I became candy stripers, starting our healthcare careers. My first memory of a physician who didn’t make me cry was the kindly general practitioner my parents took me to after our pediatrician retired. He was the kind of doctor who kept his patient records on index cards (they were 4×6 inches) and wore a reflector on his head – old school. Flash forward to second year of residency, when most primary care trainees start looking for a job. I had a potential offer from the medical group affiliated with the hospital where I was training. I had seen too much from the inside, though, to really want to work for them, so I decided to investigate whether that hospital where I first started was hiring any physicians. In a stroke of luck, they were looking for someone interested in solo practice. I was offered a start-up in the small town where I grew up. Their deal looked pretty good. Although technically employed during the first couple of years, the group allowed their sites to run like private practices and the physicians were on a largely eat-what-you-kill model. They were allowed autonomy over their practice except for certain office processes, which were paid for through a management fee taken off the top. Compared to hiring separate billing, compliance, OSHA, legal, HR, and other services, the management fee was extremely competitive. I had rotated in one of their practices as a student and had seen first-hand how things ran. Two trainees ahead of me had taken jobs with them and everything was on the up-and-up. The non-compete was such that physicians could actually buy their practices and go private, staying in the same location, once they got off the ground. Coupled with the fact that they were willing to install an EHR at no cost to me and the fact that as a solo doc I wouldn’t have to deal with anyone else’s baggage, it was a done deal. I had a lot of input on the office itself since construction had just started in a local strip mall. 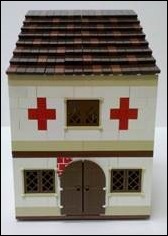 It was built for electronic health records from the beginning and was large enough to eventually house three physicians. The sponsoring hospital had done its homework and knew there was primary care demand in the community. We had people trying to make appointments more than a month before we were set to open. I completed residency at the end of June, sat for the Board exam two weeks later, and opened the practice the following Monday. I saw nine patients that first day and never looked back. I was proud to be part of the community. I had my own branding, Most people didn’t realize we were affiliated with the hospital. That was a big draw for some and gave us a certain pride of ownership I don’t think we would have had if we were visibly under the hospital umbrella. Patients loved us being in the strip mall near a high-traffic intersection, glad they could park 20 feet from the door rather than having to use a parking garage or large lot at one of the hospital-based practices. I threw candy from a float in the Founders’ Day parade. It many ways, it was a dream come true. My little office grew by leaps and bounds (“local girl comes home” is a powerful marketing statement.) Before long, I was ready to add another physician and eventually a nurse practitioner. The hospital sponsored several other start-up primary care practices, hiring a couple of my residency colleagues to help them build a troop of primary care docs to stay ahead of the community’s needs. As for my site, since we were piloting the EHR system that the hospital’s parent health system planned to implement for all owned practices, I became pretty visible as an EHR champion. Eventually I was hired as part-time medical director for ambulatory EHR. One half-day a week at the IT office became two, then four, to the point where several years later I was only in the practice one day a week. Eventually, patients’ lack of access to me became the topic of every office visit. Realizing it wasn’t good for the practice or my morale, one of our IT directors figured out a way for the hospital and IT to buy me out. It was a bittersweet decision to leave my little start-up, which wasn’t so little any more. We never turned an enormous profit, but we did break even and I had the opportunity to recruit my own replacement. It seemed like things were in good hands, so off I went to the land of IT. The practice thrived until the recession started, the auto industry failed, and other heavy industry went to states with cheaper costs of labor. I had moved on career-wise, but still had enough connections to hear the updates on “my” practice. The staff was a little less busy, the bad debt write-offs grew, and the finances moved into the red. The hospital president believed in primary care, though, and continued to subsidize the practice, knowing there was a need in the community (I’m not naïve — he also knew how many million dollars in ancillaries the average primary care doc drives to his or her preferred hospital.) And so the office stayed open. Fast forward, and the hospital (now a major part of the regional safety-net rather than a community resource that drew patients through innovation and excellence) posted several major losses, sending its president to greener pastures elsewhere. Then one of the providers left for a higher salary, followed by another who took a maternity leave and never came back. The hospital had a hard time finding a physician who wanted to care for patients with difficult socioeconomic challenges, especially when affluent practices with richer payer mixes beckoned. They weren’t willing to guarantee a salary that would have convinced someone to stay. I had last heard the practice was running with a single nurse practitioner who was supervised by a physician 20 miles away. I found out today that the office is closing. Once I stood on the sidewalk with the mayor of our small town, cutting the “Grand Opening” ribbon with his giant gold-painted scissors. Now that sidewalk will lead people to yet another vacant quasi-retail space. The provider who remains is being “consolidated” into a shared office on the hospital grounds, where physicians seem to land when they can’t get along with their partners or their practice loses too much money. Any trace of the office we worked so hard to build will soon be gone. The economic reality is that no one wants to own small primary care practices any more. The work is hard, the hours are long, and the pay is less than other specialties. Hospitals stepped in hoping to lure primary care docs to their communities and solidify their slices of the revenue pie. Once they stop making money, though (which is often the reality of primary care in our current model,) it’s the beginning of the end. Perhaps new payment models could have saved my little practice, but we will never know. Rather than having a family physician down the street or around the corner, patients will drive half an hour and navigate the maze of the hospital campus. They’ll probably be subject to a facility fee now, as I’m sure the remaining provider will be set up as a hospital outpatient department to try to eke out as much revenue as possible. Even though I haven’t practiced there in years, I feel bad about it. I’m sorry that primary care doesn’t get the respect or compensation it deserves. I’m sorry that the hospital is no longer willing or able to subsidize valuable community services. But most of all, I’m sorry for the patients. I’m grateful, though, for the time we had together, for the times I was able to help, and most of all, for the memories. Re: “The economic reality is that no one wants to own small primary care practices any more.” Not true, not true. Though independent providers have dipped far below what they used to be (now in the 30-something percent range compared with 60-something percent only a handful of years back), there are still thousands of us who prefer the overall package of a small independent practice. Yes, the hours are long, the stresses many, and the financial challenges significant, but the personal satisfaction, capabilities to have more meaningful relationships with patients/families, and the autonomy of being your own boss are strong attractors for the thousands of us who remain. I’ve said before that as long as I’m in practice and as long as I can survive financially, I’ll take small office life and its stresses over those of the employed situation, any day. First comment – way to go Dr. Gregg! One of the best articles I’ve read on HISTalk – thank you. Your writing, as always, is impeccable, but more impressive is the humanity behind the words. Medicine is undergoing a gradual, tectonic shift, the casualties are palpable. I really appreciate the work and perspective you put into these words. They are touching. Thank you. Absolutely the best column yet. Our nonsystem of health care simply does not “get” nor deliver primary care and with the entrenched interests of those large hospital systems, academia and third party payers all falling at the feet of the specialties and procedures, it is unlikely that fact will change even with the Brave New World of the ACA.